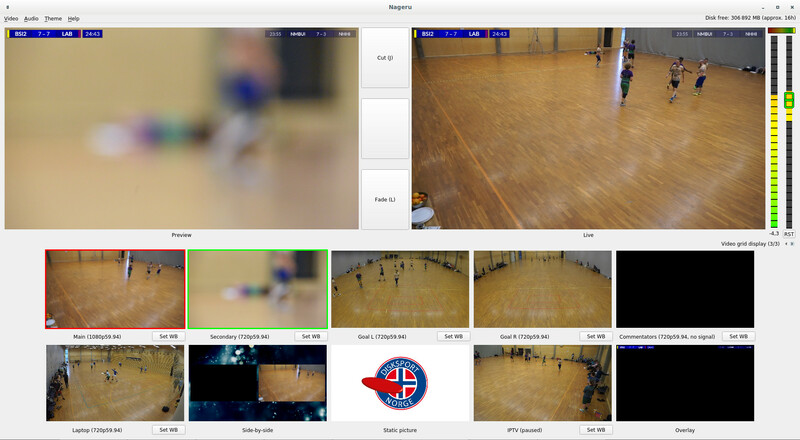 This page describes Nageru, a modern free software video mixer, and Futatabi, a multi-camera free software instant replay system with slow motion. They are separate applications, but are made to work efficiently together and share a fair amount of source code, so they are also distributed together. Documentation (and its associated git repository). Nageru (a pun on the Japanese verb nageru, meaning to throw or cast) is a live video mixer. It takes in inputs from one or more video cards (any DeckLink PCI card via Blackmagic's drivers, and Intensity Shuttle USB3 and UltraStudio SDI USB3 cards via bmusb), mixes them together based on the operator's desire and a theme written in Lua, and outputs a high-quality H.264 stream over TCP suitable for further transcoding and/or distribution. Nageru is free software, licensed under the GNU General Public License, version 3 or later. Nageru aims to produce high-quality output, both in terms of audio and video, while still running on modest hardware. The reference system for two 720p60 inputs is a ThinkPad X240, ie. an ultraportable dual-core with a not-very-fast GPU. Nageru's performance scales almost linearly with the available GPU power; e.g., if you have a GPU that's twice as fast as mine (which is not hard to find at all these days; desktop GPUs are frequently more like 10x), going to 1080p60 will only cost you about 10% more CPU power. The stream at Solskogen 2016–2018 was made with Nageru (in collaboration with other software and some hardware); you can view a copy of the 2016 streams and 2017 streams at YouTube (although YouTube doesn't seem to deal properly with 50/60 fps switches, causing jerkiness in some videos). Fyrrom in 2016, and again in 2017. All videos from Trøndisk 2017 (an example of multi-camera and overlay graphics), Norwegian ultimate championships 2018 (same, but with the newer native CEF support), and Trøndisk 2018 (also with Futatabi integration). The Norwegian municipality of Frøya is live streaming all of their council meetings using Nageru (Norwegian only). Breizhcamp, a French technology conference, used Nageru in 2018 and 2019. If you speak French, you can watch their keynote about it (itself produced with Nageru) and all their other video online. Futatabi is a multi-camera instant replay system with slow motion. It supports efficient real-time interpolation using optical flow, making for full-framerate output without having to use special high-framerate cameras. (Of course, interpolation can only take you so far, and the results will depend on the type of content.) Futatabi is currently in alpha. It is distributed and built together with Nageru. Contact information at my home page.